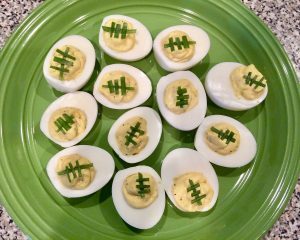 These are a classic Super Bowl staple in our house. 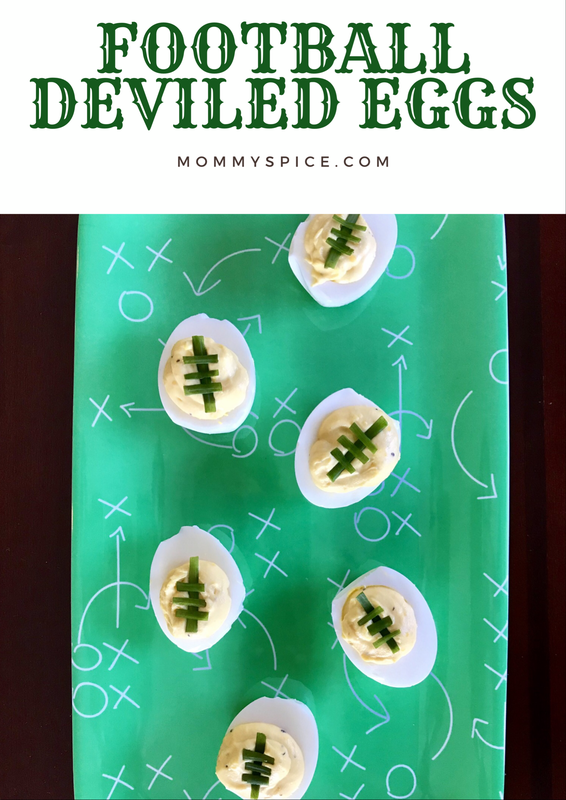 I feel as if deviled eggs are almost a seasonal appetizer. I make them pretty regularly in the spring and summer time for BBQ’s and get-together’s, but not often in the winter. 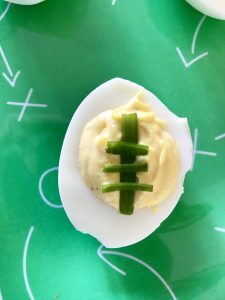 I use my classic deviled egg recipe with the addition of scallion greens to make my football laces. 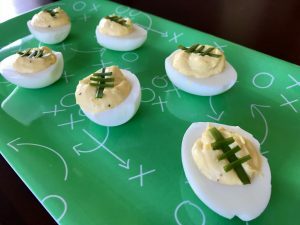 It’s hardly any more work and only one additional ingredient to make these eggs into novelty footballs perfect for any Super Bowl party. Hard boil and cool your eggs before starting. Bring a medium pot filled half to three quarters of the way full with water, to a rumbling boil. Gently place eggs in one at a time with a slotted spoon. Turn heat down to medium and cook 10 minutes. Then carefully take the eggs out one at a time and place in a large bowl to cool. If you’re short on time you can blanch them in ice water however I usually find it easier to boil the eggs the night before because peeling eggs always takes longer than expected. Everyone boils eggs differently, some add the eggs in the water before it’s boiling, some add baking soda to the water because they say it helps to peel them easier. No matter your choice once your eggs are boiled and cooled then the fun of this dish can start. Peel your eggs, rinse off any remaining small shell pieces and pat dry. Next cut length wise, carefully scooping out the yolks. Place yolks in a separate bowl, to that add your mayonnaise, greek yogurt, mustard, vinegar, salt and pepper. Mash yolks with a fork and stir until you reach your desired consistency for the filling. Next I like to make a faux piping bag to make the filling process easier and for a cleaner finished look on the eggs. Place your quart bag on the counter top and fold over the opening of the bag. 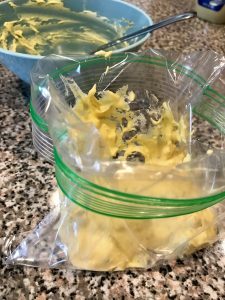 Next pour in all of your deviled egg filling, get as much air out of the bag as you can and then seal it up. Push all of filling to one of the bottom corners of your bag and then snip the very corner off to make your opening. Gently push down on your filling out the opening to fill each center of the egg whites. 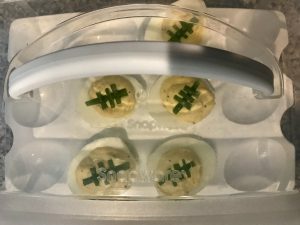 When all of your eggs are filled it’s time to make them into footballs. 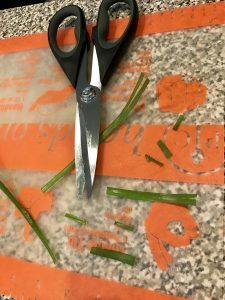 Snip the green top off your scallions and then with a pair of kitchen shears cut to open the scallion top, from there make little strips for the laces. I do about an inch for the horizontal lace and a quarter to half inch cuts for the vertical laces. Once o set my laces up on top of my deviled egg filling gently press down on the laces with the top your finger just slightly to be sure the scallion laces stick to your egg filling. Either refrigerate or eat immediately. Enjoy within 72 hours. 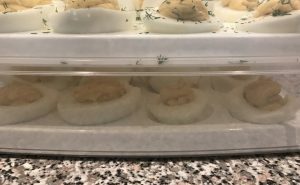 If you prefer the traditional paprika sprinkled over your deviled eggs you can feel free to add that to your filling so that the flavor will still be there. The scallion laces are pretty mild in flavor, however also easy enough to take off for even the pickiest of eaters. 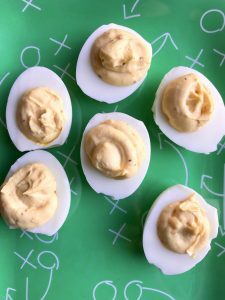 I like to have these eggs as part of Super Bowl spread to add some freshness and varying texture to the usual fried food and party dips. Also if you’re in charge of transporting deviled eggs I’ve got you covered with the best carrying case around. No more foil or press n seal taking half your topping with them when you uncover your plate.